Sometimes you just feel like breathing a huge sigh of relief after a choppy market like we've had recently. Since March 29, I have leaned bullish against 2322 SPX -- and, particularly over the past couple weeks, the market has done its best to try to trick me out of that stance. I certainly was not "pounding the desk" bullish, but I have beat the drum repeatedly that 2322 was the key level that would turn things. So, while I was tempted at several points to shift to a neutral stance, or even to lean bearish, I've continued to repeat that as long as 2322 held, I would maintain my bullish lean (the number of "no change" blog posts over the past few weeks has been mind-numbing). Today, all that is finally going to pay off. Now, I'm absolutely not trying to scare bulls off from playing here, because the best profits are usually made when things look scary. 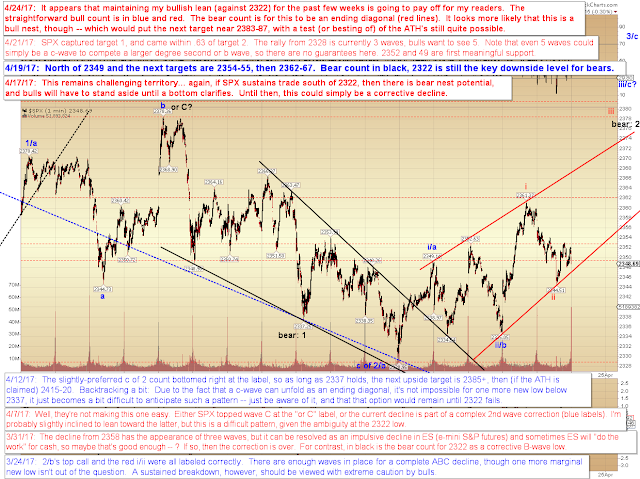 Most people were bearish near the low, but will now grow bullish as we rally. While I'm not going to grow bearish as we rally (until the market gives me a good sign to do so), I am going to grow increasingly cautious about longs. 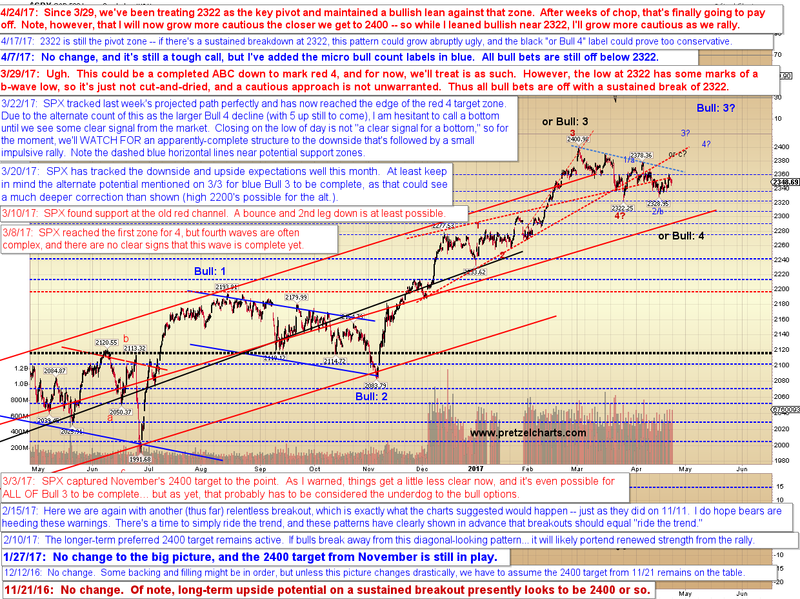 There's an inflection point in the 2380-2400 zone that may or may not present a challenge to the rally. We'll take that as it comes, but the good risk/reward for bulls was near the 2322 pivot. No change to the intermediate picture, but keep in mind that the black "or c?" represents an inflection zone, where things could shift from bullish to bearish, or -- as I mentioned last update -- could shift into the sideways chop that I'd noted would become a possibility as we rallied toward the black c label. In conclusion, it appears the near-term bull count will be vindicated, and I hope that readers are/were able to profit from it -- or at the very least, that it gave bears pause and protected them from big losses. In any case, the intermediate picture does call for good use of stops to lock-in profits as we rally into the inflection zone. From there, we'll examine the picture in real-time as it unfolds. Trade safe.